Following on from yesterdays pictures of large DSLR's compared to smaller cameras, today saw the announcement of the GF2. 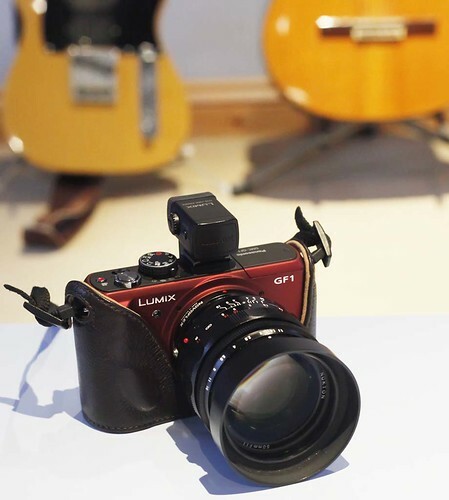 Panasonics follow up to the GF1 is a slightly smaller version of the previous camera, with full HD recording and a few other "improvements"
Its obviously been designed for a different market to something like the GH2 and on first look seems like a competitor to the Sony NEX series. Its apparently not much bigger than an LX5. Its being bundled with the 14mm f2.5 pancake or the 14-42mm zoom. The kit lens looks a little "chunky" fitted to the camera, and imaging what some of the larger m4/3 lenses will look like on it makes me wonder who its designed for. Both this and the NEX system and to a certain extent the Samsung NX system with particular regard to the NX100, has given rise to a new look for cameras. The lens-heavy compact. The idea of small cameras with a decent sensor and interchangeable lenses is a great idea but with certain developments there seems to be a lack of continuity. Is this something you'd want to pick up and take pictures with? I'm not sure I would. Actually I am sure, I wouldn't ! So is the thinking that the buyers of cameras such as these will basically stick with the lens they buy the camera with? Is it a pleasurable picture taking experience to hold out one these cameras in front of you with a large lens on it and take pictures? Say what you like about compact cameras, most of them have a sense of proportion, which seems to be lacking in some of these new mirrorless designs. Yes they look fine fitted with a pancake lens, but Panasonic only make two. Are you supposed to switch between the 14mm and the 20mm? If you want any versatility for your picture taking then adding something like a 7-14mm or 100-300mm zoom is going to result in an unbalanced camera. Holding it to your eye would give a better feel but that requires a viewfinder. Extra cost and the Panasonic viewfinder isn't great anyway. There's some idea in the reviews that the GF2 is intended for people upgrading from a compact. But then Panasonic have what is generally regarded as the best compact on the market in the LX5. I may be missing the point, but I can't quite understand why someone looking for a small pocketable compact would want a GF2 as opposed to an LX5. The GF1 was a lovely little camera, and quite groundbreaking, in that it seemed to be an attractive option for many kinds of photographers, from holiday snappers to professionals. I and I'm sure many others would have liked the GF2 to be a development from that camera. Have Panasonic not sold enough of the GF1? Is that why they have gone for a re-think? Is the GF1 going to be discontinued? I've been looking at buying a GF1 again, as prices currently are very attractive. The rumours of the GF2 made me postpone that decision, but now having seen it I will get a GF1, as it seems much more a "photographers camera" to me. I hope Panasonic aren't going to turn into Sony throwing out lots of different versions of cameras at every conceivable price point. They obviously have to respond to what they see as competition, and a company like Panasonic won't have the same mind set as Leica or Nikon do, as these are specialist camera manufacturers. The camera division of Panasonic is just that, a division, and it has to pull its weight in terms of sales. I hope the GF2 is a roaring success, as any increase in m4/3 market share can only benefit all of us who love the system. It may well be. Just because it doesn't appeal to me doesn't mean that it won't appeal to others. You know me. I could even end up buying one! !